Canadian designer Marian Bantjes loves her work. 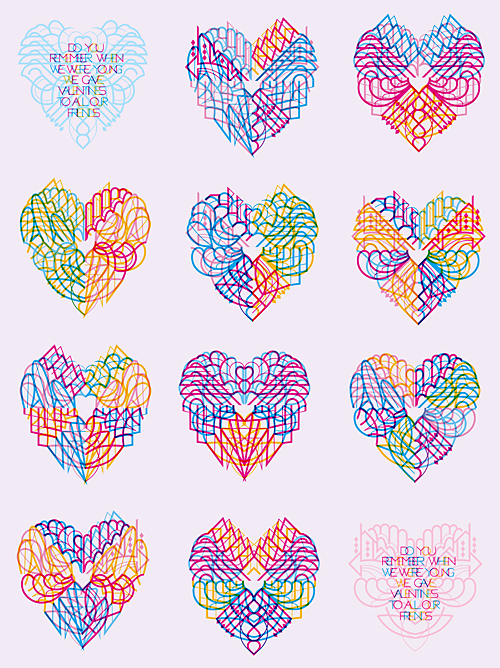 She is a prolific and imaginative artist and claims she does it all for love. 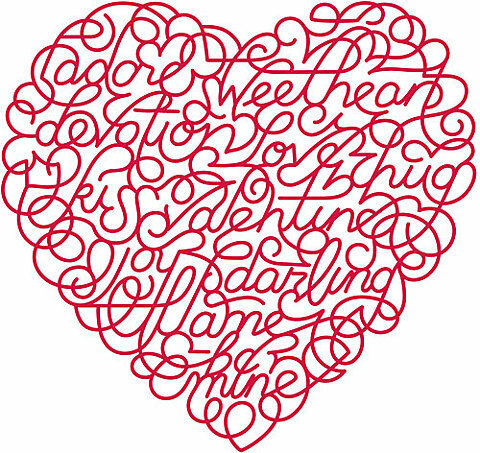 In the video below, sponsored by Lynda.com, she discusses the heartfelt Valentine designs she made this past year and sent to all of the special people in her life. Since 2005, she has been producing Valentine designs that are terrifically ornate, as only she knows how to do. Below are samples of some of her designs from former year's and a nice video of her discussing her 2011 designs. 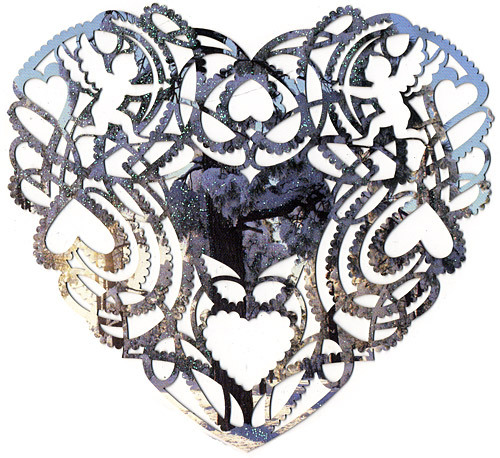 The 2010 Valentine Design above was a laser-cut card made from recycled holiday cards she collected. Because of the variety of cards, each appeared surprisingly different despite the common laser-cut. 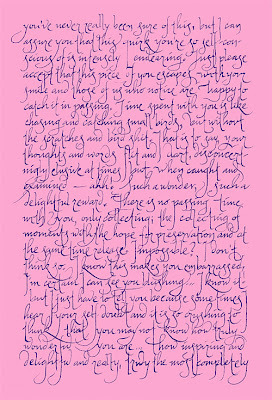 This handwritten letter above was Bantjes 2009 Valentine's mailing. She described this version as more "conceptual" than in year's past. 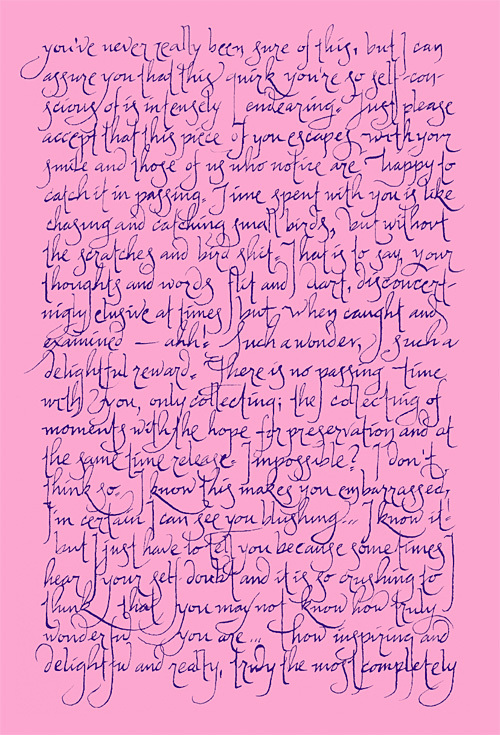 It involved writing in her own hand, 4 fragments of letters; each with no beginning or end; and each written in a manner which may resonate to some degree with each recipient. Everyone received just one fragment. 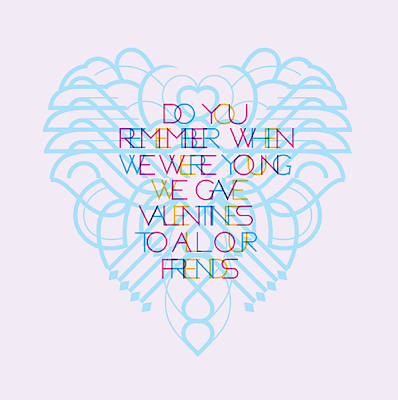 Below is a Valentine Bantjes designed for Saks Fifth Avenue. 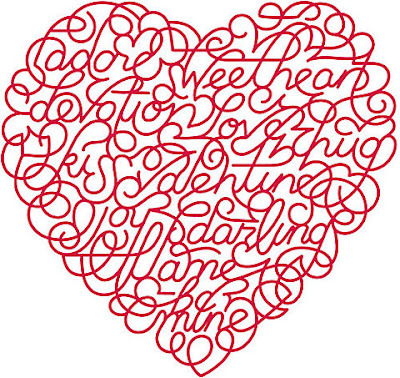 It contains a lacy pattern of endearing script words, forming a beautifully textured heart. 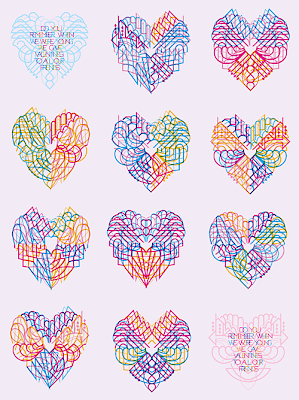 This work was so well received, it has been ripped off multiple times, including t-shirts in China. Is this someone's idea of "free love"? Saks now owns the copyright on this work and their lawyers are standing by. Deal with it. Quite impressive designs. So loving.